Tony Blair has promised one of the most "vigorous and intensive" police manhunts the UK has seen to catch those responsible for the London bombings. "We will pursue those responsible wherever they are and we will not rest until they are identified, and as far as possible, brought to justice." He told MPs that Londoners' "stoicism" since the tube and bus bombs, which claimed 52 lives, was an inspiration. The prime minister said Britons were "determined... not to be defeated". Conservative leader Michael Howard praised the government's response to last week's atrocity. "We wish to give the government our full support as they face difficult decisions in the future," he said. Liberal Democrat Charles Kennedy also struck a note of unity and chose to highlight the condemnation of the attacks by the "vast majority" of British Muslims. How many mothers' hearts shall be maimed? Earlier Mr Howard had called for an inquiry, to see if any lessons could be learned. In the Commons he said it should be of limited scope with its remit determined by the government. 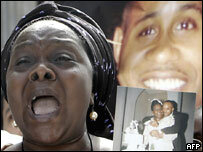 It should not interfere with the current efforts to identify the dead or catch the bombers, he said. Mr Blair said everyone involved would want to see if there could be improvements in their response. Those responsible for killing 52 and injuring more than 700, probably Islamic extremists, would be hunted down. 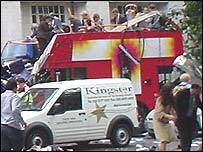 "The 7 July will always be remembered as a day of sadness," Mr Blair said before pointing out that people were determined to return to normal just four days later. "At the moment of terror striking, when the eyes of the world were upon them, [Londoners] responded and continue to respond with a defiance and a strength that are universally admired," he said. The government is prepared to introduce new emergency anti-terrorism powers if the police and the security services felt these were needed, he said. The prime minister's official spokesman said ministers believed they had identified where new powers were required, but were willing to listen to any request from the security services for other measures. Scotland Yard says its inquiry has been helped by a strong response from the public. A book of condolence has been opened at City Hall in London, with mayor Ken Livingstone the first to sign it. Home Secretary Charles Clarke wants all EU countries to agree that communication firms retain details of all calls made, texts and e-mails sent for a year. London Underground reported that passenger numbers were down slightly on usual numbers. Since the bombings the main political parties have made a point of saying they need to put on a united front. And in the usually combative Commons there was a rare unity among MPs of all parties. 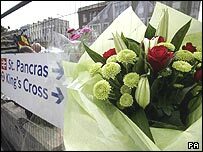 Mr Blair said that the sort of people who carried out the attack on tube and bus passengers were "by their very nature" hard to stop. "But our security services and police do a heroic job for our country day in day out and I can say that over the past years, as this particular type of new and awful terrorist threat has grown, they have done their utmost to keep this country and its people safe," he said. Police and security agencies say they are now almost certain that they are not dealing with a suicide bomb attack.